An unhappily married assistant D.A. (Wendell Corey) falls in love with a mysterious woman (Barbara Stanwyck) who shows up in his office one night. When Thelma Jordon (Stanwyck) is put on trial for killing her wealthy aunt (Gertrude Hoffman), Corey does everything he can to save her — but is she really worth the effort? In a variation on her most famous role (blonde Phyllis Dietrichson in 1944’s Double Indemnity), Barbara Stanwyck stars as a wily femme fatale leading a love-struck nudnik down a thorn-lined path. Yet Jordon is not nearly as duplicitous or evil as Dietrichson; her motives are gray rather than black, and we don’t get the sense that she is a true sociopath. Ironically, it’s this very lack of understanding about what makes Jordon tick that ultimately undoes the film, given that we don’t sympathize with either her dilemma or Corey’s. In addition, we must suffer through several unbearably dated scenes in which Marshall’s sympathetic, beautiful 1950s wife (well-played by Joan Tetzel) forgives her husband for his indiscretions, and basically implies that it wasn’t his fault for straying from their marriage. 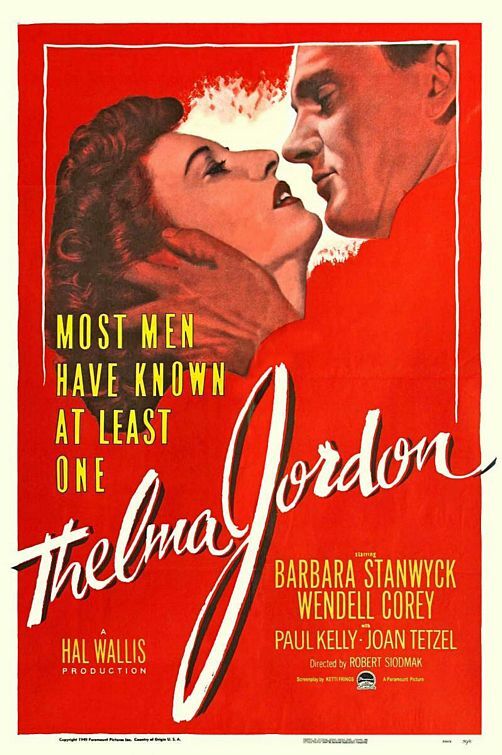 Nonetheless, while Thelma Jordon isn’t among director Robert Siodmak’s best work, it remains a reasonably enjoyable noir thriller — thanks in large part to the fine performances and atmospheric direction. Wendell Corey as the love-struck Assistant D.A. No, though any fans of noir, Barbara Stanwyck, and/or Robert Siodmak will undoubtedly want to check it out. I had tried to watch this sometime before, but the opening scenes were already revealing this as a singularly tedious film – with over-ripe, over-written dialogue – that I just couldn’t go on. But today I did. And things do not improve…at all…once beyond those opening scenes. As director, Siodmak attempts to stay confident and professional, so everything looks ok. But the poor cast, saddled with something intended to be quite tense – which is quite lifeless. Only one good scene: Stanwyck alone with her own attorney (Stanley Ridges, the only member of the cast unaffected by the rest of the script); nicely acted, nicely paced. The whole thing eventually builds awkwardly to one of the dullest court trials in cinema. The very earnest conclusion is laughable. All told: ugh.